Multiplex Connection to Community Energy System? Council is having a special meeting this afternoon to consider designing the Aquatics Centre/Multiplex so it can be plugged into the Community Energy System (CES), which looks like it may now be a reality thanks to new funding announced last week. The CES would generate steam from waste energy at the Canadian Hydro EcoPower Co-Gen plant at Canfor. This steam would then be piped across the city and be used to heat large public buildings. (Overview of the plan HERE) The catch was that Aquatera had until the end of 2009 to start taking steam. The project has a long history, at least as long as I've been on council I think. Back in the day Ald. Carol-Lee Eckhardt helped us get a grant from FCM to do a study on the feasibility of the project. The results were that the concept is technically possible but that the business model was hampered by Alberta's system of natural gas rebates, and the high upfront capital cost of construction and the eccoPower Centre was finally built in 2003/4. The provincial rebates artificially made using natural gas cheaper when prices went up and reduced the incentive for organizations to sign up for the CES. We lobbied the provincial government quite a bit and eventually had the law changed so that any future rebates for natural gas would also apply to bio-mass projects like the CES. Barrier #1 removed. Upfront construction costs were still an issue of course so it languished. The first three phases were estimated to cost $23 million in January of '08. Of course part of the cost of construction would be recovered through the rates paid by customers but at $23m it would drive the rates up so high that they (again) wouldn't be competitive with the existing natural gas system. It would need at least $12m in "no-cost capital" (aka grants) to make it a feasible alternative to natural gas at current rates. So it wasn't until City Council committed $6m in a narrow 5-4 vote in the fall of '08 that the project seemed to have some legs again. As we rolled in to 2009 the clock really began ticking on the deadline for Aquatera to start taking steam by the end of the year, or risk loosing the right to do so. The $6m from the city was good but we still needed to find some way to get up to the $12m mark. So about March GP submitted four applications to the Building Canada Fund; Art Gallery Reconstruction, City-Wide Wireless Network, Landfill Gas Extraction and the CES. As far as I'm concerned the CES is the perfect application; it's something that is labour intensive (building the plant and running the pipes through the city), wouldn't happen without the additional support, we have our 1/3 ready and it delivers new "green" infrastructure that can reduce CO2 production by about 13,000 tonnes/yr. In the interim, construction was progressing at the Aquatics Centre / Multiplex. Although the facility isn't set to open until 2011 if we wanted to plug it into the CES some important design decisions needed to be made early on. How many hot water boilers would we have? Large boilers like these are not "off the shelf" things, they are "build-to-order" and need to lead time. Would the roof-top heating units be natural gas fired or not? If they're not then it changes how we plan for hot water lines to run up to the roof. By the start of May it had reached a point where city administration needed some direction from council: are we building the multiplex to plug into the CES or not? On May 4th council considered the issue and voted 7-2 (Ald. Wong and myself opposed) in favour of building in the traditional manner. We were told that if we got positive word on the Building Canada application soon we should be able to change direction without too much wasted time or cost. Fast forward to last week when it was announced that we will receive funds from Building Canada for the CES ( I hear it should be enough to get us to the magic $12m mark) and all the sudden it looks like council may have some reconsidering to do. A meeting has been called for this afternoon at 1:30 to review the impacts of the new money towards the CES and design implications for the multiplex. I hope we'll end the day with council reversing it's previous decision and directing admin to go ahead with building a flexible system at the multiplex. I'm not naive enough to believe that things will finally go smoothly for the CES from here on out but hopefully we're on the way. I thought I'd try something different today and post the agenda for my 10am General Government Services committee meeting. This committee meets every second week and generally deals with things like internal corporate services (IT, and Finance) as well as the administrative functions of the corporation. Below is the agenda for today's meeting. The names you see below the agenda items are the staff members who are presenting the report on that item. My quick comment is in italics. In Camera basically means "behind closed doors" and it is generally used to protect privacy or in situations where the discussion is part of a negotiation. The rule of thumb is that you can use it when discussing "Legal, Land or Labour" issues. This is a regular agenda item that comes at least every quarter and provides an over view of the city's finances. Most of council will be away at the start of June for the FCM conference (I'll be staying home) so some meetings will be cancelled. This is a once yearly item. The city has a lot of paper stored and by law we are allowed to destroy certain things after a certain amount of time has passed. Looking at the list there is some stuff as old as 1973 and some as new as 2006. Did you know the city owns the airport? Well, we do and we lease it to the Airport Commission. This is approving a lease for a private building on the airport land. This is the result of our strategic planning session in Jasper and these documents guide how the city does business and what council sees as the priority items that need to be dealt with. These are all letters, ect that we've received from various government departments. I have to go, I've got 19 minutes to get to city hall to make this meeting. What do you think was this worthwhile? Should I make this a regular part of the blog? Badly needed improvements will finally happen at the 68th Ave & Poplar Drive intersection. This spot has been become dangerous as traffic has increased due to the development of the Country Side South (& North) and Signature Falls areas. As these new neighbourhoods filled up it increased the number of people travelling east/west along 68th ave. A few years ago council responded to resident concerns by putting in a pedestrian activated crosswalk but it looks like the time has come for full signalization. If I remember correctly the crosswalk light was put in so it wouldn't have to be moved when this full-scale development came along. Anyhow, keep your eyes open for the changes happening at 68th & Poplar - right near the Shell Station. 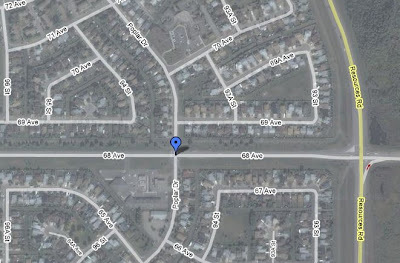 Efforts to improve traffic flow in the Poplar Drive-68 Ave. area are under way. Installation of temporary traffic lights at the 68 Avenue and Poplar Drive intersection will occur this week in an attempt to ease congestion and improve safety. After the lights are set up, they will flash for one week to allow motorists to become accustomed to the new system. They will flash yellow on 68th Avenue and red on Poplar Drive. Flashing yellow directs drivers to proceed with caution; flashing red means to stop the same as at a stop sign. In addition to new traffic lights, plans to twin 68 Avenue and several intersection improvements will help address the heavy traffic flow through the area. The remainder of the upgrades are expected to begin in 2010. As the IMCL conference as wound on it's been interesting to note some of the attendees here from Alberta and western Canada. Some of the elected officials I've seen at the conference are; Red Deer Mayor, Morris Flewwelling, Strathcona County Councillors Linda Osinchuk & Vic Bidzinski and Medicine Hat Councillor, John Hammill, Kelowna Councillor Andre Blanleil. There are also quite a few Canadian planners, parks department staff and other administrators coming from Victoria to Regina to Hamilton. Just noticed that Grande Prairie realtor Sandra Easton has some great info on her website. What really caught my eye was the latest CMHC report on the GP real estate market. It provides a great overview of how the market has changed over the last few years and how it puts the recent "decline" in housing prices in perspective. This shows how the market, including local builders and developers, really ramped up production to try and meet the demand of the last few years and how that demand dropped off sharply. 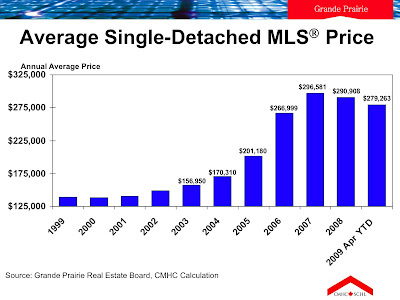 This slide shows the average selling price of single family homes - notice how the recent drop in prices still leaves the average price well above 2005. This slide in prices might not be over yet but it hasn't been as steep as one might have thought. 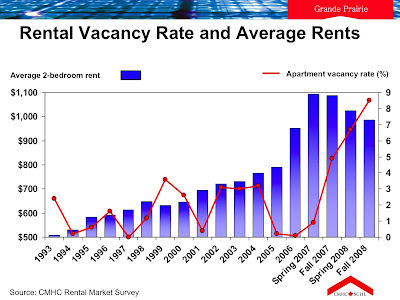 This final slide looks at the rental market and overlays the changes in apartment vacancy rates with the average monthly rental price. You can see how the limited supply (near-zero vacancy rates in '05, '06 & '07) drove up the costs to rent and how as the vacancy has gone up the cost has come down, slightly. 1. The built environment of our communities has a deep impact on our culture/social development. What I took away: Ideally, if communities are built to be safe and beneficial for children it will ultimately improve life for everyone. A pretty good point if you think about it - I mean; what are our children learning during their day to day lives in our modern communities? I'd suggest they are learning that you drive to go buy a carton of milk, that you play alone in your own backyard (on your own swing set) and that "nature" is also something you have to drive to. Broad generalizations, I know, but there's some truth to it. If left unchecked these trends can ultimately lead to communities where people don't know their neighbour, physical activity drops & obesity rates increase. The good news is that we can design our communities in ways that encourage active forms of transportation (like walking or cycling) and in ways that bring nature in to everyone's day to day experience. These are all very familiar themes that have come up from our MDP public consultation. The bottom line here is that sprawl likely can't be addressed without some form of regional planning. And, ultimately there needs to be some sort of legislated boundary that limits urban growth - often called called an Urban Growth Boundary (UGB) down here. Oregon set up regional planning back in the late 70's. In the Portland area this means that there are 25 different municipalities (each with their own council) and a Metro Council that handles a few select services, delivered over the whole region. It's essentially another layer of government between the local (municipal) and state levels. I don't believe that adding another layer of government is the right way to go to address sprawl in Alberta - it's not in our 'DNA' to support something like that. But the current system that leaves all these decisions subject to negotiation between local councils isn't working. When it comes down to it there's too much self-interest; municipalities are competing with one another for development that provides property tax revenue. Sure, it's possible for a municipality to take an altruistic approach and and restrict urban growth within it's boundary... but that's really not useful if the development just hops to an adjacent municipality. I think there are some structural changes that need to happen in Alberta if we want to get serious about addressing sprawl and protecting our valuable, productive farmland and natural areas. I've heard of Charrettes before and it was interesting to hear that there will be a training session by the National Charrette Institute in Olds in a few weeks. The project is huge and probably has lessons for the Wapiti Corridor Planning Group in the GP Area or the River Valley Alliance in the capital region. This was a thought provoking session that looked at efforts to quantify the value of parks and public art in hard money terms. Things like; do property values increase near parks/natural spaces? Do large public art installations have a noticeable effect on the local economy? That's all from day one - on to day two! First off; Happy Mothers Day! Unfortunately I'm not in Grande Prairie to take my mom out for brunch, I'm starting off this Mother's Day in Portland, Oregon - sitting in Peet's Coffee. So, Mom, the best I can say is that I'm thinking of you and I hope the phone call will suffice - thanks for being you! I'm in Portland for the 47th Annual Making Cities Liveable Conference (IMCL). I hadn't heard of the event until last fall when all of council was emailed an invitation to come. The invite immediately piqued my interest because Portland has a very good reputation for great neighbourhood planning, redevelopment and public transportation. Added to the fact that the host city has a great reputation the conference has a great program - that really strikes home. commuting by foot and bike. Land Use principles for the healthy city. Health effects of sprawl. Sprawl, lack of community & social pathology. Dangers of social isolation for the young & the elderly. Psychological effects of the built environment. Making streets work to improve social & physical health. Make towns - instead of traffic planning & housing development. Evaluating TODs: case studies. Including transit in development review. Environmental justice in transportation planning. Innovative new TOD projects. Sustainable regional transportation & land-use planning. Promoting regional identity. Curbing sprawl. Focusing development in town centers. Achievements in limiting big box retail. Importance of contact with nature for health & well-being. Natural urban places for exercise, adventure, relaxation & stimulation. Natural beauty & well-being. Designing & restoring parks, community gardens, wild areas. Restoring biodiversity. So with all those great sessions (and many others) it looks to be a worthwhile week and I'm happy that I chose to come here and forego the FCM conference that happens at the end of the month in Whistler. During the week I'll be posting from the conference, covering the highlights of the sessions. Registration is today at 1pm and I'm looking forward to getting started! Last night at council we gave final reading to the 2009 property tax bylaw. Unfortunately we had to increase property taxes more than we had predicted back at budget time last fall. This unexpected increase wasn't something we were happy to do of course but it had to be done. The crux of the issue is that the Provincial Government chopped money out of the Municipal Sustainability Initiative grant when they delivered their budget a few weeks ago. Even though it was distributed unfairly, when it was announced the MSI was supposed to be a program that would allow municipalities to make long term planning decisions. Listening to that direction here in GP we went ahead and put that money to use; it makes up a significant part of our funding strategy for the new aquatics centre and multiplex. So the unexpected reduction in the MSI is a big problem. This is a problem for any municipality in Alberta that took the Province at it's word and made plans for the MSI money. Those rich municipalities who were just putting the MSI money away in reserves for "future projects" are probably ok but for those like Grande Prairie who used it to deliver on community priorities are scrambling. City Council gave third reading on a bylaw Monday that sets property tax levels for 2009. Bylaw C-1225 raises taxes by 9.4% to cover a $2.5 million shortfall in Municipal Sustainability Initiative (MSI) funding. The City received $4.7 million of an anticipated $7.2 million in MSI dollars. City Administration had projected a 7.5% property tax increase for 2009. MSI funding was decreased by $200 million across the province. Grande Prairie’s share was allocated to the construction of the Aquatics and Wellness Multiplex. Twenty-two per cent of total property taxes collected in Grande Prairie are remitted to the education system. Property taxes are calculated by yearly assessments, taking into consideration average growth and market increases or decreases. The growth increase for Grande Prairie in the 2009 tax year is estimated at 5.4% and the average market value has actually decreased by 5.8%. 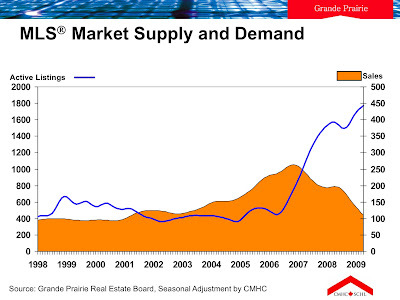 The market value of properties within Grande Prairie has changed slightly. Houses or low density residential homes have dropped in value by 8.7%, apartments have decreased by 17.4% and non-residential properties have increased by 3.9%, based on July 1, 2008 assessments. A mill rate is established by dividing the revenue requirements by the assessment base and multiplying that number by 1000. For 2008, a home owner whose house in Grande Prairie assessed at $303,900 would have paid $2639 in property taxes. The same house will now be assessed at $277,500 and the property holder will pay $2887 at the new rate, an increase of $248. The difference is equal to the cost of approximately 23 litres of gasoline a month, over a year." The Grande Prairie Storm had a great season, wining the AJHL and going on to the Doyle Cup. 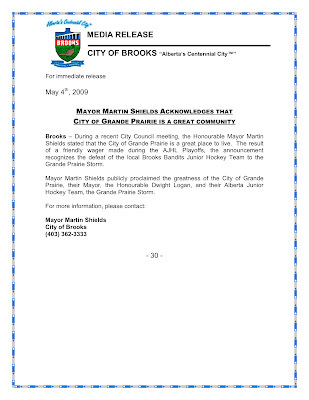 The win in the AJHL finals was over the Brooks Bandits and it was enough to open the eyes of the Mayor Shields of Brooks to how "Great" Grande Prairie is. He's a good sport.